Elk meat has long been considered the premier venison. Since North America imports 150 tons of venison annually, elk meat enjoys a ready market. It fits the needs of the modern consumer because it is lean, low in fat and cholesterol, and delicious. Plus, it is raised using no growth hormones or chemicals. 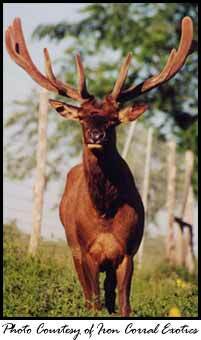 Many enjoy hunting a trophy animal, a mature bull with a beautiful set of antlers. People enjoy watching elk and will pay to visit them in a natural setting. The leather is soft, yet durable. It is used to make boots, gloves, and other articles of clothing. The antlers are used to make jewelry, pieces of art, and decorative accessories for the home. Elk enhance the habitat, utilizing marginal land and leaving land in forage, in pasture, or as undeveloped land. In raising domesticated elk, we learn valuable lessons that can be applied to the wild population. Elk are raised in a setting natural to them, with minimal handling. There is no castration of males. Antler removal is for the protection of the animal and owner, as well as for economic benefits. Antler removal is very humane and is accomplished under vet care, with no injury to the animal. Elk eat most upland grasses (e.g. broom) and legumes (e.g. alfalfa). Elk will consume grains (e.g. corn, oats). Elk can consume up to 20% of their diet in browse. Elk are efficient converters of food. Three cow elks' feed intake is the same as that of one beef cow. The feeding of cows and bulls is slightly different; therefore, it is better to separate them after the rut. For a cow, post-rut to calving, feed a maintenance diet of good quality hay, grain optional. For a cow, calving to post-rut, feed grain, hay, and a high-quality feed rich in protein, vitamins, and minerals. Bulls should be fed well all year, but especially in the summer. During winter, bulls should be fed a much higher quality diet than that of cows, so that can regenerate after the rut. If possible, weaned calves should be kept separate and fed extra the first winter. The elk's weight at the end of October is directly proportional to its weight at the end of March. The calorie intake of an elk is twice as much in the summer as it is in the winter. Feed elk very well in the summer to achieve optimum velvet weights and calving percentages. Farmers can put elk on self-feed if they slowly bring them up to that consumption level (full ration). Remember: Feed is the most important part of managing your elk herd. DO: Feed the best possible feed. You will get better results, and it costs less because of less waste. Elk pick through poor-quality feed to get the good. Make sure the ration is well-balanced with an adequate supply of copper and selenium. 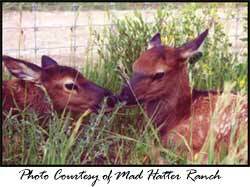 DON'T: Pasture elk exclusively on fescue or use feeds with urea as a source of protein. Elk are hardy livestock with natural immunity to most diseases. Although they can contract normal bovine diseases, they are not prone to do so. There have been cases of domestic elk with TB (M bovis) as with other domestic stock (e.g. cattle). Testing requirements and tests have been developed to better identify and eliminate TB in elk. Elk now have a federal UM&R herd accreditation program for TB. TB has been eradicated in domestic herds. Internal and external parasites are of concern if you tend to over-pasture or keep your elk too closely confined. Consult your veterinarian for the proper drug to treat the parasite. If you do suspect a problem, call a vet, an experienced elk rancher, or the NAEBA office for assistance. Plan before you start. Check with NAEBA and with as many elk breeders as possible. Elk, like any animal, must be taught respect for the handler. Walls of the handling facility should be a minimum of eight feet high. Solid walls, under a roof, are recommended. Use gates and alleyways to move animals. A fence should be a minimum of seven feet high and constructed of high-tensile wire; however, check state laws for minimum height requirements. Treated wood or steel posts should be 10-12 feet long and a maximum of 24 feet apart. 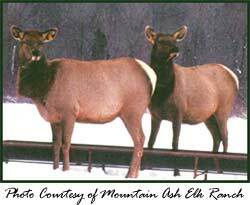 Elk can be easily moved in enclosed livestock trailers. They need room and cannot be crowded during transport. Contact your local Department of Agriculture or Department of Natural Resources for regulations that may affect your elk ranch. Contact local elk farmers and NAEBA for additional information on costs of animals, fencing, feed, etc. Purchase your stock and fencing equipment from reputable farmers and dealers. One source for stock breeders is the NAEBA Breeders and Boarders Directory. Try to keep the true capital cost of the fence to 10% of your total investment in your elk venture. Elk are a very attractive investment if you have land, can put up the fence, and have animal experience.